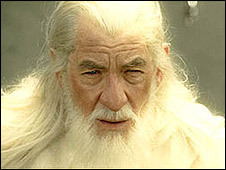 Sir Ian McKellen has confirmed he will reprise his role as Gandalf in the film version of JRR Tolkien's The Hobbit. Guillermo del Toro has been named as the director of the movies, to be made back-to-back in New Zealand. "I spoke to Guillermo in the very room that Peter Jackson offered me the part and he confirmed that I would be reprising the role," Sir Ian said. He also said del Toro would be starting the script in about six weeks after he has finished filming current project, Hellboy 2. According to studio New Line, the first film will be an adaptation of The Hobbit and the second will be an original story focusing on the 60 years between the book and the beginning of the Rings trilogy. "As to how it's going to work over two films and what going to happen on screen, well Guillermo has not got down to working out the major details yet - I can tell you it's going to be amazing though," Sir Ian said.